This kit will enable you to build a timepiece featuring a "persistence of vision" LED readout. This is an advanced project involving machining work, electronic assembly of conventional and surface-mount components and a little hand coil winding. The finished clock is uncased, it is left to the constructor to make a suitable housing and stand. The assembly is sized to fit inside a Norton Wankel engine rotor which was the basis of our prototype. 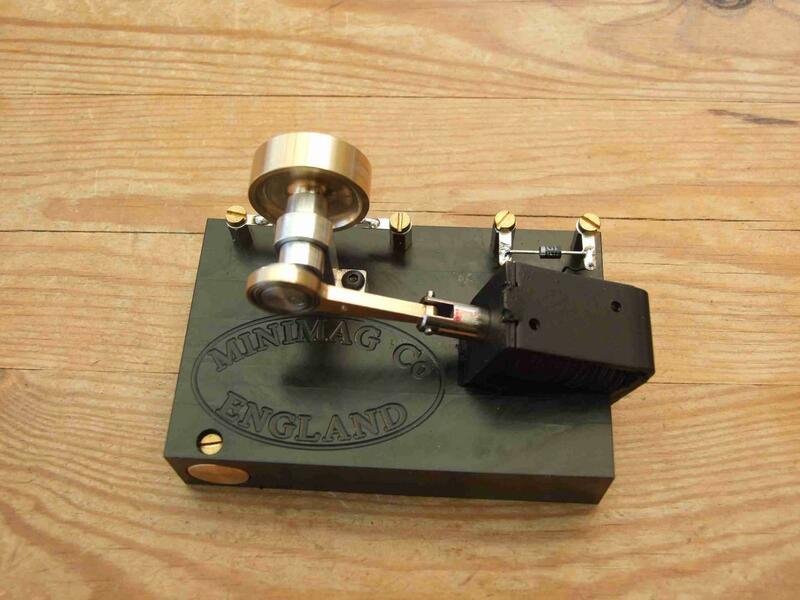 You may have seen it on our stand at recent model engineering exhibitions. 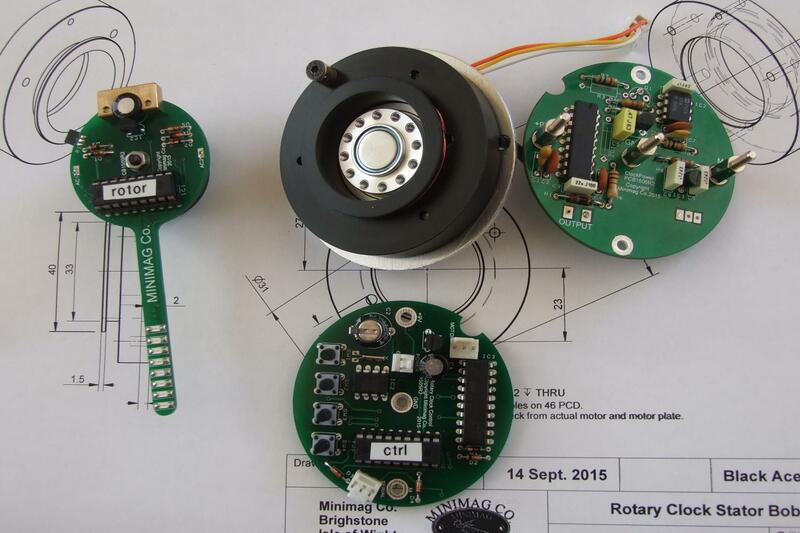 A line of 8 LEDs mounted on a counterbalanced rotor arm is caused to rotate at high speed. The LEDS are switched on and off at predetermined times, referenced to a fixed point. Due to the high speed of rotation the eye perceives the rotor as a fixed display. Each displayed character is formed in a 5 x 7 dot matrix. It can display numerals 0 to 9, letters A to Z in upper case together with a few special characters. the innermost eighth LED is used to form a cursor to aid programming. Timing and rotor dimensions allow for twenty characters to be visualised. In operation the display cycles between time, date and a programmable user message. A three-phase motor drives the LED rotor, providing stable and low vibration running. Power and display data is transmitted to the LED rotor through a novel air-gap transformer, avoiding the need for slip rings and brushes. Clock timing is generated by an accurate crystal-controlled timekeeper and maintained by a supercapacitor in the event of a power outage. Pre-programmed and tested microcontrollers, one for timing, one for the rotor arm. As with all our products, telephone and email help is always freely available. By popular request, we've produced an unusual "engine" operating on electromagnetic principles. Although of little practical use, the engine demonstrates an alternative means of producing rotary motion by electricity. The "piston and cylinder" is a high efficiency solenoid actuator coupled to an eccentric shaft and flywheel. A single 1.5V AA cell provides enough power to run the engine for many hours. Timing for the power stroke is obtained using a magnet embedded in the flywheel which operates a sensitive reed switch. There is no ON/OFF control. A gentle flick starts the engine going, when stalled, the design ensures that the solenoid remains de-energised. The engine is available fully built and tested and also as a kit of parts including bearings, fasteners,bar stock and high density plastic material for the base. A full set of A4 drawings accompany the kit. Easily built in a day's workshop session. A comprehensive build manual in PDF will be emailed once your order has been placed. Speed: Approximately 1000RPM on a new cell. Power: Single AA cell in a compartment in the base. Please contact us if you would like to place an order.